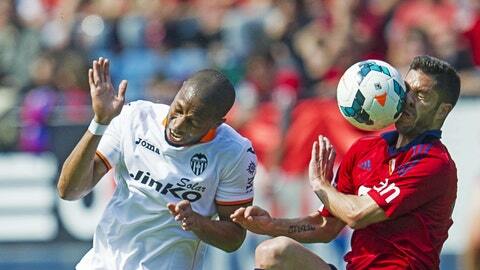 Valencia's Seydou Keita goes up for an aerial challenge with Osasuna's Alvaro Cejudo. Valencia forward Jonas came on in the second half and scored a late equalizer to secure a 1-1 draw at Osasuna in the Spanish league on Saturday. Striker Oriol Riera put Osasuna ahead in the 19th minute when he tapped in a rebound that Valencia goalkeeper Vicente Guaita knocked down to his feet. The hosts controlled the match, with Roberto Torres hitting the upright in the 53rd, until Jonas took a pass from fellow Brazilian substitute Araujo on the run and slotted an angled shot inside the far post in the 82nd. The draw left Valencia in eighth place and six points from the final Europa League berth, while Osasuna inched four points from the relegation zone. Valencia visits Sevilla on Thursday in the first leg of their Europa League semifinal.